Is that Vomit on your Toes? Like many who work in the Sydney CBD every day I go through the painful and uncomfortable process of catching a bus into work. Today it’s raining, which means the bus is more crowded than usual and everyone is wet, and cranky – me included. On days like this you just want to be curled up on the couch with a good movie, not being sandwiched against a cold window by a guy who is too big for the seat with a wet leg – that he keeps pressed up against you no matter how many times you try to shift away. Normally you can tune out the one annoying person who has their music up so loud that the whole bus feels like they are plugged into this persons iPod, but today the dulcet tones of Keith Urban grate on my nerves, and along with the others, I shoot the offending girl filthy looks. Every time the man behind me coughs, I feel a patch of moist air brush my neck, which makes me jump forward in an effort to get out of the germ firing line. All of this is compounded when I realise that the rain has also bought out a larger than normal amount of stupid drivers clogging up the bus lanes. As we inch through the traffic I lean back in my seat (though not too far in case moist air man coughs again) and try to tell myself I have been on worse bus journeys, and I really have! 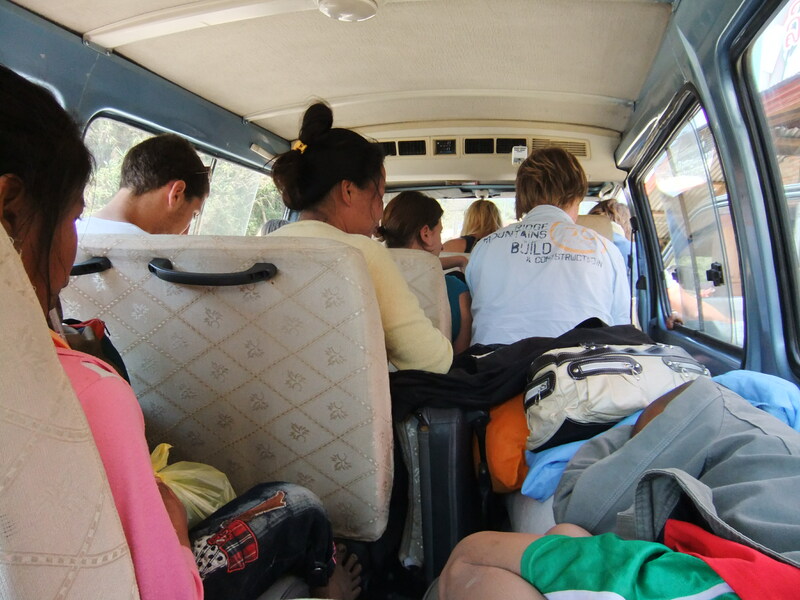 The worst bus journey of my life was on the road from Vang Vieng to Luang Prabang in Laos. Like all who travel through Laos these days, my travel buddy and I had stopped off at Vang Vieng to go tubing – though this was before it was a major tourist trap, the snippet in Lonely Planet wrote was less than a page. After a couple of days we realised how addictive the life style is – getting up late, lying in a tube while sipping drinks that are poured into easy-to-hold buckets, hanging out in sunlit bars meeting new people, eating dinner in a restaurant that is constantly playing re-runs of Friends, hanging out in another bar until midnight, then sleeping in late… We met more than a few people who could boast of being there for 150+ days and although, we mocked them for being there for so long, we too, kept extending our stay. We met a guy from Australia who was 38, he had worked in the mines and was taking a year off traveling and hadn’t got any further – he was the one who taught me that a Tuk Tuk is never full, you can always hang onto the roof, side, back or driver’s door. Eventually though we woke up and said enough! Before our resolve weakened we had packed our bags and headed to the bus stop to get to Luang Prabang. Luang Prabang was the place everyone had told us to visit – even Lonely Planet – a beautiful French Colonial town nestled between the river and the mountains that are filled with crystal waterfalls and pools. The route is meant to be amazing, some say legendary, with spectacular views – and I am sure it was, but I couldn’t appreciate it. Now, in all fairness we had been warned that the route was dangerous and the road uncomfortable, we had splurged and spent the extra 50c to upgrade our tickets… the upgrade was the still same minivan – we just got the whole back seat for our packs and us! The rest of the bus was full, there were some fellow backpackers sitting up front, but they didn’t speak much English and had the same slightly yellow tinged skin as those who had spent too much time at Vang Vieng developed. In the middle was a local family, a mother with her son and daughter. At first the road and the view was nice and I enjoyed reclining and relaxing – this only lasted about ten minutes. The bus then started climbing, winding back and forth up the mountain. The road jack-knifed back on its self so quickly that you hardly had a second to see the view before you were facing the other way. Our driver seemed to relish throwing the bus round every corner. As we rose higher into the mountains the bends became more elaborate, so did the sheer drop that I could glimpse every few minutes, which intensified the horror. We opened our windows slightly to let the air into the stuffy van to alleviate the building nausea. With each turn I could feel myself turning green but resolutely plugged in my headphones and let the music drown out any thoughts of my breakfast. After a while a smell reached me that made the mental hold I had on my stomach quaver. The Laos boy in the middle of the bus was vomiting into a little plastic bag. I glanced at my travel mate in horror – she looked green and like me, using every inch of strength to hold it together. We both retreated to our corners and private hells – staring out the window letting the fresh air blow away some of the nose-curdling stench. After an hour my iPod died leaving me with no distractions – I turned to my friend and we played some road trip games and chatted in broken sentences. I could see ahead of me on the ground, three plastic bags filled with the boys vomit. He turned to his mother for another one, but she didn’t have any, the boy looked at her for a beat, before vomiting into his hands. His mother looked at him for a second before launching at the window and heaving her own guts up. We watched with horror as she hung her head out the window as we went round yet another bend. Suddenly my friend realised what was about to happen and within a split second had slammed her own window shut – just in time – vomit splattered all over her window. She leant back and closed her eyes with hands desperately clenched in front. Suddenly she jerked her eyes open and pulled her legs up off the ground and tucked them to her chest – I looked at the bus floor trying to see what had scared her. The vomit was now sliding down the back of the bus. I pulled my own legs up fast. The next two hours were cramped and uncomfortable having our legs tucked up under us as the vomit sloshed around beneath us. Finally the bus reached the top of the mountains where there was a typical rest stop. We climbed over the boy who was slumped on the floor of the bus lying in a pool of his own vomit, completely drained and upset. I wanted to help him, but thought that I would add to that pool if I stayed there for too long, instead his 12 year old sister cleaned him and his mother up. We grabbed some Cokes and crackers and went to admire the view. It was amazing! There was a cyclist group up there, they were cycling the famous route and said that the view along the route was spectacular – as steep as the hill was, I seriously considered joining their group just to get away from the bus. As is the way in South East Asia, these little pit stops can take 5 minutes or a couple of hours depending on what the driver feels like doing – this was a long wait. 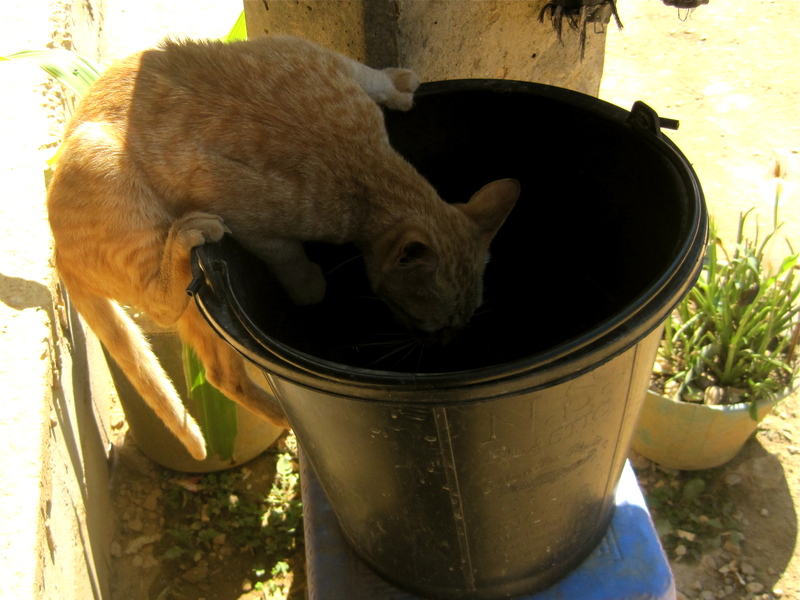 We spent most of our time watching a stray cat try to drink water out of a bucket without getting its paws wet – but at last it was time to get back in the van. Everyone appeared to be in better spirits as the bus started going downhill. This only lasted a moment. The driver had an unreasonable hatred towards using the brakes, as we reached each corner he would touch them just enough to swing us around the bend. There were more than a few occasions where we skidded on the gravel that marked the edge of the road and the cliff. There was one occasion where I swear one of the wheels was hanging over the edge of the cliff – my heart dropped over the side of the cliff even if my body didn’t. Then the poor boy started vomiting again into his hands… his mother flung her head out the window once more. Only good thing was that the bus was facing downwards, the vomit pooled in a different direction. When we arrived in Luang Prabang we were so happy that we caught the first Tuk Tuk to the first hostel. Sadly we were not able to rest once we arrived as there was a Buddhist festival being held at the temple next door – which involved chanting all night and using the giant gong every 15 minutes – something which would be culturally appealing in daylight, but painful at 3am. Despite the lack of sleep and the memory of the horror bus ride we thoroughly enjoyed our time in Luang Prabang. The town is just as beautiful as everyone had promised – we ate brunch at little French bakeries, swam with elephants, walked up waterfalls, sipped drinks while tourist watching and lost ourselves in the giant markets. When it was time to leave we considered heading back to Vientiane but that would mean getting back on the bus route. We decided to take the slow boat to the Thai border… we never realised how slow a slow boat could be… I guess the name was the giveaway. It was beautiful for the first two hours and then it was just painful. We were sitting on wooden seats for two long days. The only entertainment we had, was talking to an English couple that were clearly on the path to breaking up the minute they could get away from one another. At the end of day two I almost wished for the bus… almost. After the Luang Prabang travel experience a bus ride on a rainy day is a piece of cake. 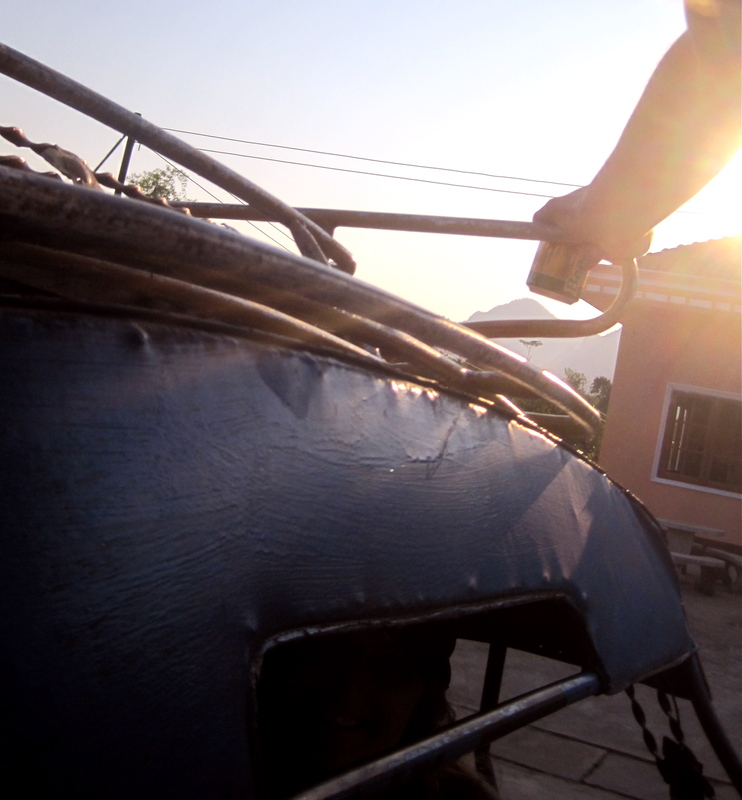 This entry was posted in Laos and tagged bus ride, Luang Prabang, slow boat, tubing, Vang Vieng by The Lite Backpacker. Bookmark the permalink.